They are located on the site of the former monitoring station in Berlin. You see: « forgotten TV with the symbol Unity painted; Installations and partly braided sculptures made of old wood, hops and other materials from the terrain. Marvin Schütte invites artists to make him sustainable. The whole area has a size of about 40,000 square meters. The painter and sculptor Mané Wunderlich has designed part of the property. 1. A figure with a hat was laid on the floor « hutWunderlich ». 2. The well-known symbol « Unity » is a universal thought of unity, A peaceful symbiosis of Berlin’s landmarks, Radio and television tower, the Brandenburg Gate and the Reichstag dome, As a floor sculpture « Unity 10te » made of old wood. They are prompted to add branches. 4. 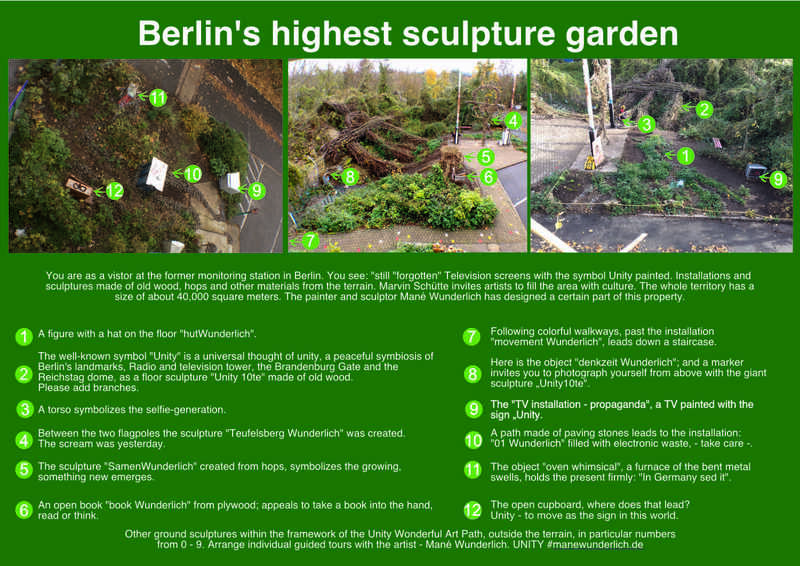 Between the two flagpoles the sculpture « teufelsberg Wunderlich » was created. The scream was yesterday. 5. The sculpture « Samen Wunderlich » created from hops, symbolizes the growing, something new emerges. 6. An open book « book Wunderlich » from plywood; Appeals to take a book into the hand, read or think. 7. Following colorful walkways, past the installation « movement Wunderlich », leads down a staircase. 8. Here is the object « denkzeit Wunderlich »; And a marker invites you to photograph yourself from above with the giant sculpture „Unity10te ». 9. The « TV installation – propaganda », a TV painted with the sign „Unity. 10. A path made of paving stones leads to the installation: « 01 Wunderlich » filled with electronic waste, – take care -. 11. The object « oven whimsical », a furnace of the bent metal swells, holds the present firmly: « In Germany sed it ».